I’ve been asked the question: “How do I wear denim on denim?” Read on, and I am going to answer exactly that. I think a Chambray shirt could almost be included as a staples mix to your closet. Mix it up by introducing some fun pieces to the denim on denim to break it up. Be aware that wearing lighter denim will highlight the areas it is hitting, so if you want a more figure flattering shade, go darker. Don’t go beyond the denim on denim such as adding a denim handbag, denim shoes or other denim accessories. If you want to take it slow, some baby steps could include wearing a denim jacket with white denim jeans, or a denim/chambray shirt with black denim pants. Below I am showing you how I have broken up the denim another way by adding a longer stripe top. You could totally play around with this and add any sort of longer shirt or even a longer jumper under a denim jacket. You could add some statement heels as seen in picture above or even a statement necklace as shown below. Now, let us move on to wearing a denim skirt. I have a favorite denim pencil skirt I purchased from Gap years ago and it has had a heck of a lot of wear out of me, another staple might I suggest. Wear the denims in different shades, as shown here, I have a lighter chambray top and a darker denim skirt. Following is another example of wearing the same darker denim pencil skirt but this time adding a lace peplum top that has a chambray base coming through. I purchased this peplum last summer and I find a pencil skirt is just the bottom to pair it with. A Fall/Winter must have this season is a fur jacket (faux, of course, darlings). I have worn this faux fur vest with my denim base and helped to break up the denim by adding some contrast on top. Some gold glitter ballet flats to boot, and your ready to rock it out the door. 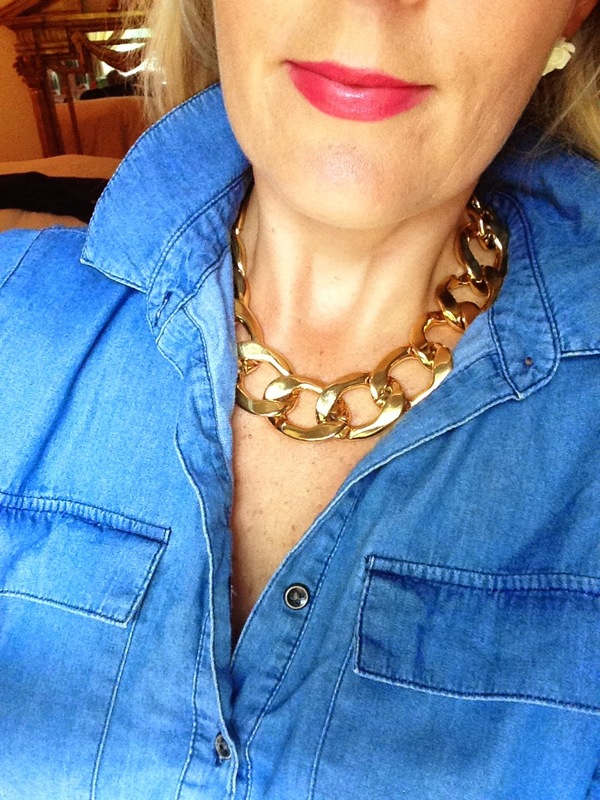 Now for some denim fun…… a few months ago I had a fun time harnessing my inner J-Lo as I re-created an outfit I found her wearing in a magazine, denim on denim. No judging please! This is for your viewing pleasure. Now lastly comes the important stuff. How to look after your denim – Never put it in the dryer. Wash on cold and hang or line dry. And follow the label when you buy a new pair. If it says “Color may run if you rub against anything light”, listen. 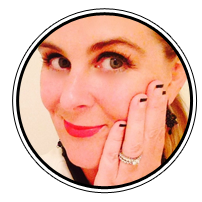 I once had an aquaintance sit on my cream coloured couch and she was wearing a new pair of dark denim pants, and they got all over my cream couch – awkward!As you can see here and in many of my other posts, fashion and styling are supposed to be total fun. The goals of styling, in my book, is to muck around with it, color a little outside the lines if you want but most of all, help it make you to feel more confident about yourself and that you are giving back to yourself. Keep on styling yummy friends and leave me a comment below. Finally an answer to a long standing fashion question I had. Thanks for setting me straight with such fun styling examples. It's impressive how you manage to put together such different looks from a few staple pieces. Ok up next, is there any truth to the old saying "blue and green should never be seen unless there's a color in between"? Hi Natalie, thanks so much for your comment and I am glad you enjoyed reading about Denim on Denim. As you know I think the most important thing is how an outfit makes you feel, so if you feel good dabbling in denim, I say "Go for it, girlfriend!" I had a lot of fun with the post, it was a blast to muck about with style, my most favorite thing to do!